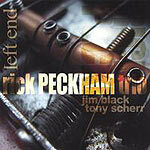 Rick Peckham's credentials are definitely from the jazz world: Gigs with John Medeski, Jerry Bergonzi, Mike Gibbs and Dave Liebman. On faculty at Berklee College. Graduate of North Texas State University. But on his first recording as leader, Peckham leads his trio through an hour of some heavily rock-based improvisational jams that have as much in common with the Allman Brothers or Jeff Beck as they do with John Scofield or Oregon. Peckham is a monster guitarist, with a full arsenal at his disposal. From modal jazz noodlings to heavy-metal axe attacks, Peckham has as broad a range of tricks up his sleeve as you'll find. But he leavens that technical brilliance by putting the music first. Nothing groundbreaking here compositionally, just interesting songs (he wrote all but one of the 13 tracks) that show imagination and taste and give him plenty of room to dazzle you with his technique.